1) All puppets with the exception of sock. Do I really need to explain? 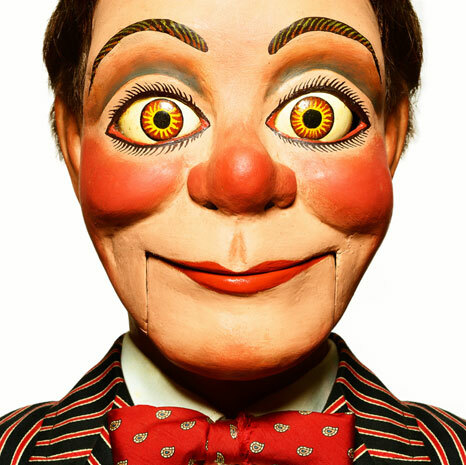 All are so creepy, especially ventriloquist dummies. Sock puppets, however, are on my love list. All my sons’ school projects will hopefully be able to be done in sock puppet. 2) When, on a television show or movie, or in a book, someone throws away the results of a paternity test without opening it. I will stop watching. Seriously, it’s why I stopped watching Veronica Mars. (That and I couldn’t tell any of the male characters apart for some reason; they looked like identical clones to me.) If you are going through the trouble of ordering the test, at least look at the results! 3) Cooking. There are few things in the world that I hate as much as a hate cooking. Even though I am half Italian, I get little to no joy out of watching my kids eat something I’ve cooked. One of the reasons I still bother release paper copies of my books is I love seeing the tangible results of my endeavors. When you cook something, the most you can hope for is that it will all be gone in an hour or two. No matter how yummy it is, I think, “Why did I even bother?” I also had to stop bringing sandwiches to work for lunch because the act of putting something between two slices of bread and wrapping it up was enough to infuriate me. Now I just bring frozen dinners that everyone yells at me for eating because of the salt, but at least microwaving them doesn’t make me want to rage at the world. I think it’s also the time sink of cooking that bothers me. When we get home from work and school, we have very little time together as a family before the kids go to bed, and I would really rather spend that time with them than in the kitchen. Nothing puts me in a better mood than going to the park after work, and then getting a slice of pizza. I get to have fun outside with the kids, and then no cooking and no clean up. But even though we live in New York City, and yes, we have some of the best pizza available, sometimes I am forced to cook nevertheless. But nothing makes you appreciate the days of swings and mozzarella like those days with the oven and dishes. As I’m writing this, I remember my son reprimanding me this morning for using the word “hate,” so I am downgrading this to the list of strong dislike. But I want it noted that “dislike” doesn’t seem like a powerful enough word to adequately describe the loathing and horror I feel when I see a ventriloquist dummy.